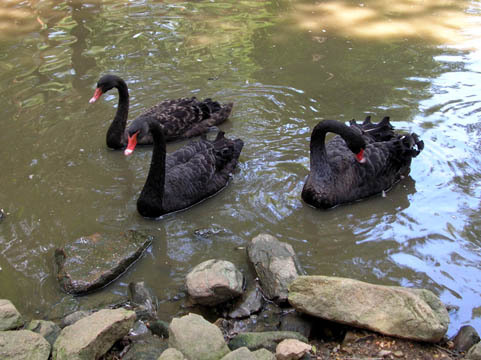 Black swans at the Catoctin Wildlife Preserve and Zoo. 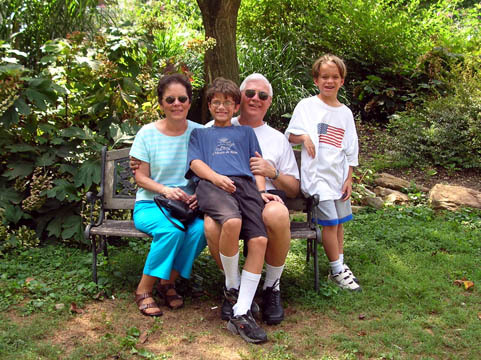 They had a nest and there were signs warning that the swans would attack anyone who got too close. 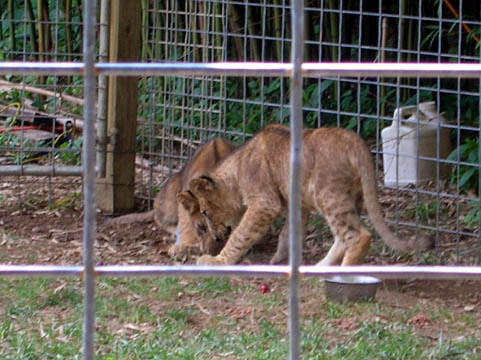 These lion cubs are named Asacari and Keito and were born on April 29th. 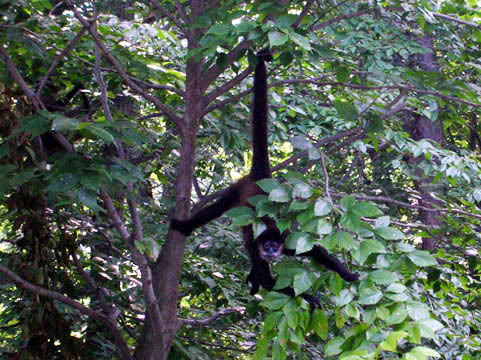 A spider monkey hangs from a tree on the island where it lives, able to make faces at the people but not to reach them. 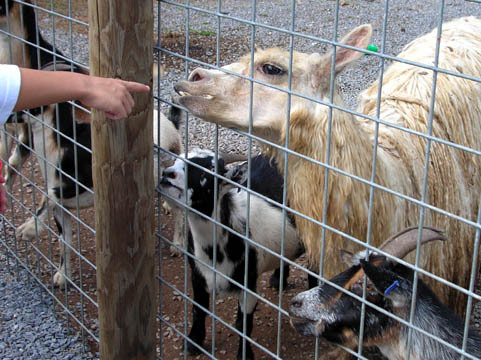 Adam points out the extreme buck teeth on this alpaca, wondering why HE doesn't need braces. 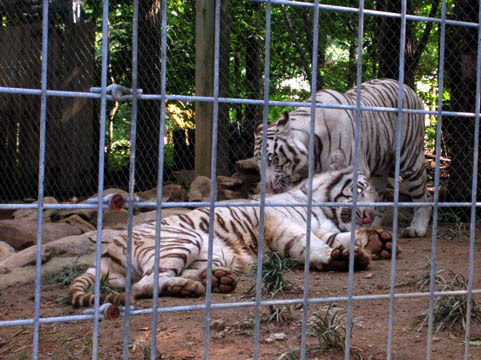 Bengal tigers grooming each other. 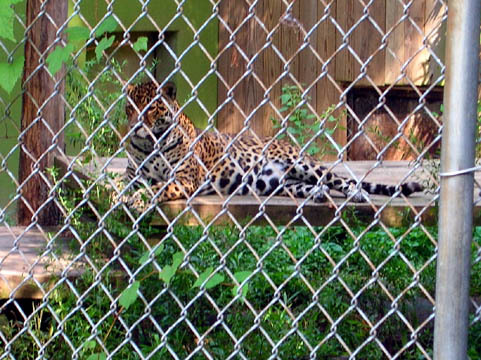 This is Evita, a pregnant jaguar; her mate Diego did not deign to put in an appearance. 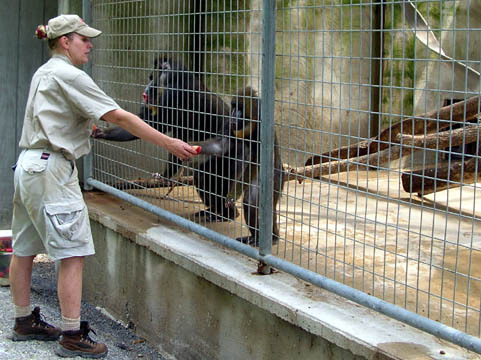 The male mandrill kept trying to smack its companion out of the way to steal her pieces of plum, which is why the naturalist is holding her hands so far apart. 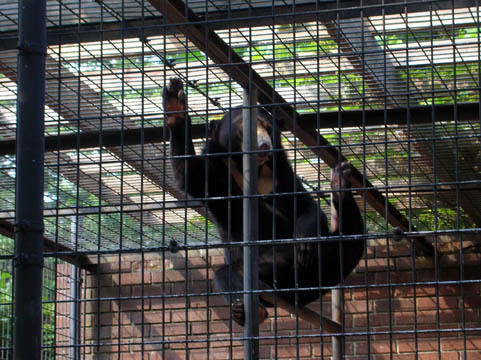 Sun bear hanging and bouncing from the bars. 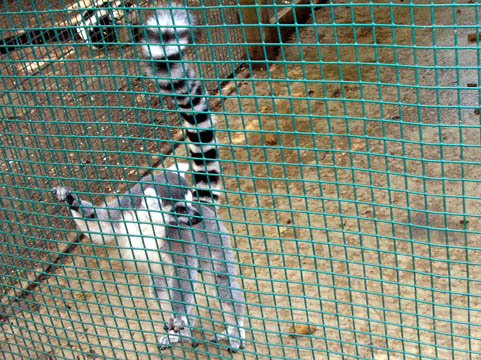 A ring-tailed lemur prepares to race up the bars of its cage to hang from the ceiling. 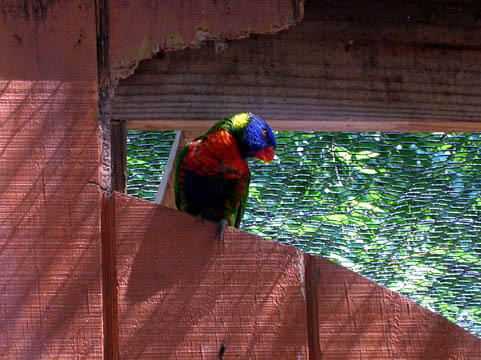 Who do you think gnawed the uneven wood above this colorful Australian bird's head? 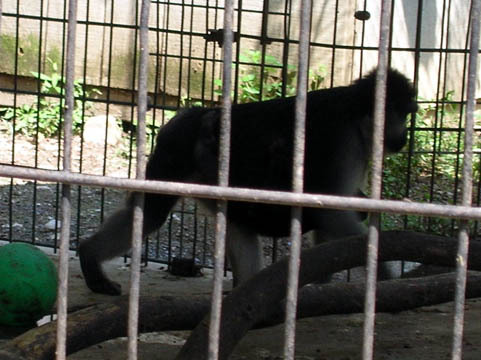 This rare gray-armed macaque is nursing a baby, which is clinging to her belly, as she prepares to climb to the walkway to the indoor enclosure. 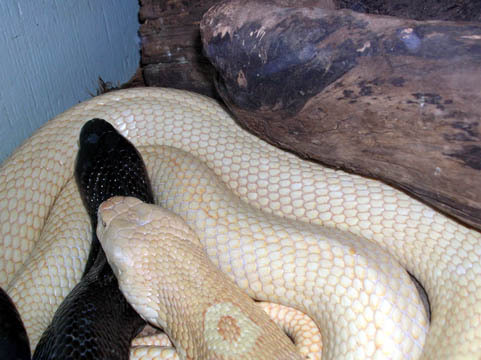 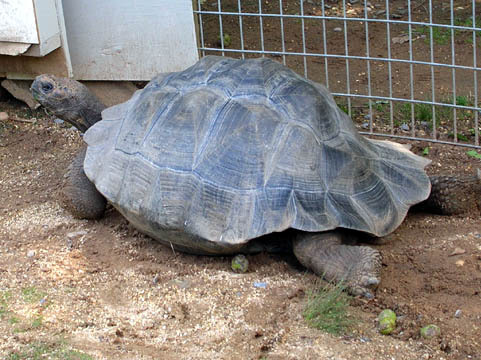 One of the nice things about this zoo is that kids are allowed to feed all the safe animals which can be given approved feed. 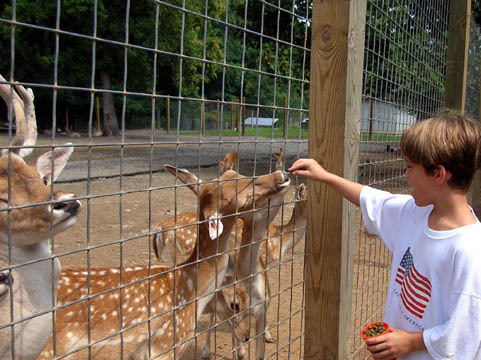 Here are fallow deer, begging -- you'd think half a dozen other people weren't standing around feeding them! 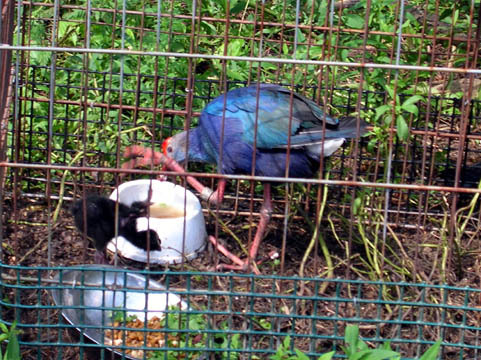 A mother and her chick circle their food dishes. 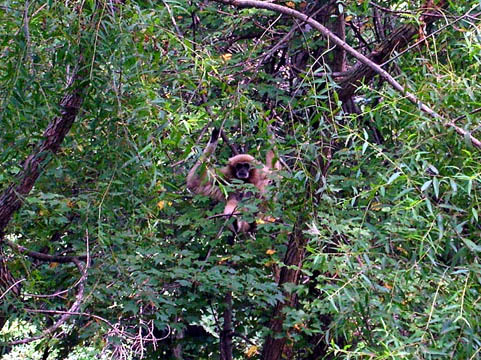 A gibbon on its island. 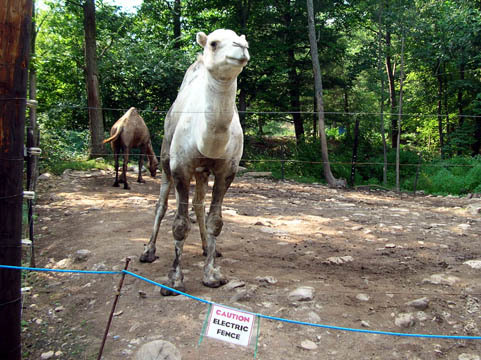 This camel that apparently is not overly worried about that electric fence.